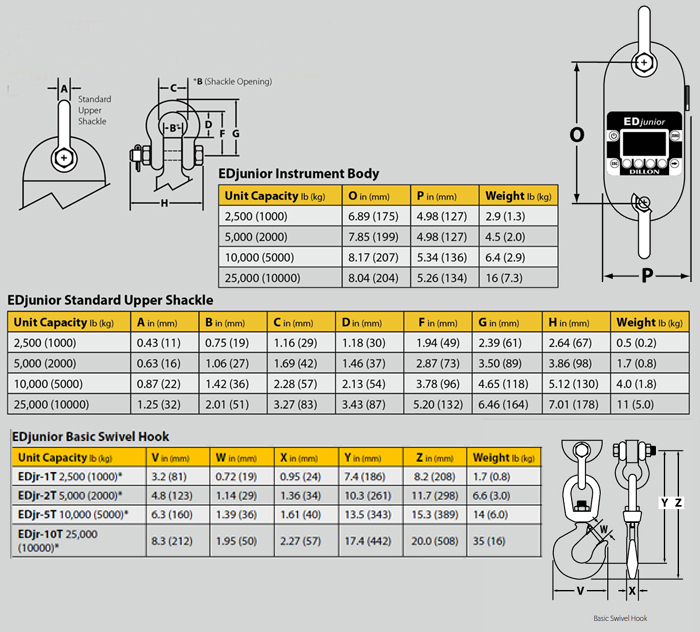 The EDjunior Crane scale is well suited for applications that are looking for a reliable, rugged, outdoor suitable instrument at an extremely affordable price. 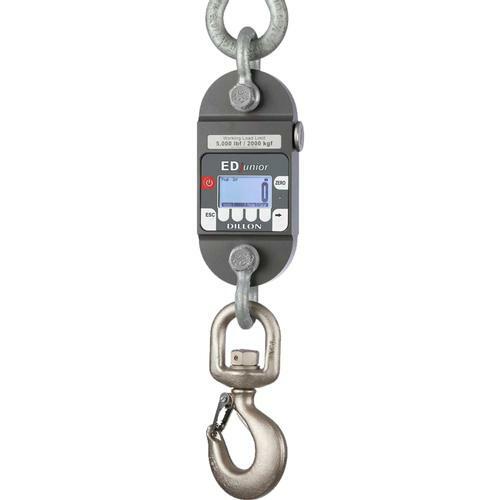 The price includes a dynamometer, standard upper shackle, basic swivel hook , manual, 2 C-cell batteries, calibration certificate and a wooden shipping crate. Accuracy — The load element design and strain gauges chosen for the EDjunior produce an accuracy of 0.2 % (full scale). This level of precision offers flexibility for use in a broad range of applications. Capacities up to 10,000 lb (5000 kg) available. The exclusive Dillon SOFTKEY interface provides direct access to setup and display functions without the typical confusing menu structure. The 6-digit dot-matrix display features 1 inch (25 mm) high numerals for greater visibility. Heavy, cumbersome tools make tough jobs even harder. Through the use of aircraft quality materials, Dillon has made the EDjunior an easy-to-position, highly mobile instrument with exceptional strength. It offers an impressive factor of safety at all capacities. Standard upper shackle, basic swivel hook , manual, 2 C-cell batteries, calibration certificate and a wooden shipping crate.